The Rocky movies are heavily considered to be essential entertainment – not only did it introduce the world to Sylvester Stallone, but they are considered the absolute archetype for every great sports movie known to man. Through each film, from the Academy Award-winning first film to the belated swan song of Rocky Balboa in, erm, Rocky Balboa (after nearly everyone, including Stallone himself, thought that the fifth one wasn’t a very good place to leave such a character), the “Italian Stallion” has faced several difficult challenges, whether they be fighting Mr. T, taking on a giant Russian “super-athlete” shaped like Dolph Lundgren, facing bankruptcy and intense pressure from a Don King-type, or even taking on a boxer half his age, but every time he picked himself back up against the odds, and one inspirational training montage later he was ready to take on the world. But at last, in Ryan Coogler’s series spin-off Creed, we see a side of Rocky we’ve never truly seen before; a fighter that’s truly vulnerable. To discuss in detail what exactly makes him so vulnerable would be telling, and you really need to see the film to get the full picture (and also because it’s a really damn good movie), but know going in – especially if you’ve never seen the previous Rocky movies – that he’s not in a good place at all. His beloved wife Adrian has passed, as has his best friend and constant comic relief source Paulie, while his son has moved out of the country and keeps in semi-regular contact with his father. Put simply, the once-champion boxer now has no-one, and his loneliness as a result of retreating into a quieter lifestyle is completely warranted, something that the younger Rocky never really seemed to consider due to being swept up in his popularity and his undying love for his family and friends. This is a new character element added by co-writer Coogler, and after years of Stallone being the kingpin of the franchise that kick-started his career it’s refreshing to see a new pair of eyes give the character something more humble and grounded to work with, and the Fruitvale Station director brings out perhaps the most impressive performance that Stallone has ever done, at least in recent memory, proving that underneath the exterior of the guy who went on to become Rambo, John Spartan, an Expendable and (to less popular effect) Judge Dredd is a truly soulful actor that still has plenty to give the world outside of his trademark slurred speech. Though Stallone is undoubtedly what people are going to be rightfully talking about the most when they come away from this film, many other elements from Coogler’s direction to the writing to the performances from the other actors are all commendable qualities that shouldn’t be wholly ignored. On its own, it’s an impressively-made film with Coogler building on his promise after the critical success of Fruitvale Station, delivering a boxing movie where every punch is felt, both physically and emotionally, and where the match itself rightfully takes a back-seat to the character development, though the build-up to it is always underplayed but still there. Coogler uses long tracking shots to great effect, including one entire match that seems to be nothing but a continuous shot which leaves us no choice but to be in the same ring as these characters, and the way everything is shot and paced makes this a great piece of filmmaking (a trait we hope is passed on to the Black Panther Marvel movie he’s been rumoured to direct). Michael B. Jordan, reuniting with Coogler after his star-making lead role in Fruitvale Station, is a great lead as Adonis aka “Donnie”, the illegitimate son of fallen boxer Apollo Creed – Rocky’s one-time rival and later friend, until Dolph Lundgren’s Drago got in the way of things in the delightfully bizarre Rocky IV – who is eager to become a name on his own terms, without the weight of the father he never knew. Jordan makes for an intimidating presence, though it never once makes him unlikable, and whenever he steps into a ring you always know he means real business; it’s never just an actor pretending to feel these emotions, you actually feel that he could knock a punk out just with his angry stare (maybe he’s always thinking about working on Fantastic Four). He also sparks a good chemistry with almost every actor working opposite him, from Stallone to Tessa Thompson’s love interest Bianca (the latter being a musician whose progressive hearing loss also makes for some good minor character moments), and even in scenes on his own he’s a charismatic watch and undoubtedly an on-screen talent worth watching out for in the future – just don’t put him in the same room as Josh Trank. 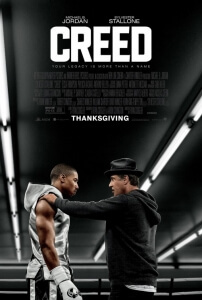 Much like the main character, Creed will always find it hard to escape the shadow of the titan that came before it – and though some scenes come close to resembling the first Rocky film, it’s still a formula that works – but it eventually comes out swinging a left hook that delivers a knockout of a film, one that both Coogler and Jordan can proudly add to their growing resumes, and also one that Stallone himself can look back on with loving eyes and be thankful for, due to its giving new life to a legendary movie franchise that was getting, to refrain from not using puns, a little rocky. Creed is both a fantastic continuation of the beloved Rocky franchise, with Sylvester Stallone giving one of his best performances in years, and also a great piece of filmmaking by Ryan Coogler who directs scenes with unmistaken passion, made even more so by the great performances he also gets out of Michael B. Jordan et al, and real heart. It’s a champ.